ButtonShy Games has just launched their playtester network for upcoming wallet games. These are all games using just 18 cards packed in a tiny little vinyl wallet. I've had a couple of wallet games published over the years and I'm very excited to see the next one come to life. Anthelion: Conclave of Power is based on John DuBois' Avignon: Clash of Popes, a clever 2p strategy game where players push and pull cards in a tense tug-of-war. Anthelion takes that fun gameplay to the stars in ButtonShy's Pocket Universe space opera setting. Your goal is to gain enough star power in your conclave to sway the galaxy. 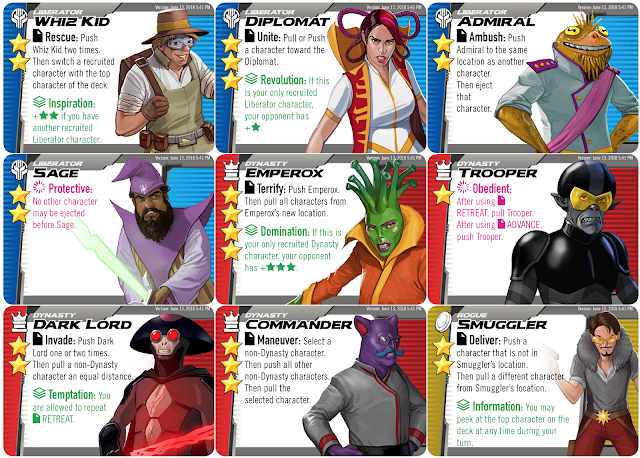 This playtest pack includes the base game: four Liberator characters, four Dynasty characters, and four Rogue characters. Each has their own abilities, attributes, and resources. We've also included two expansion factions to test: The Androids and the Fuzzies. I'm very eager to see how these play out in blind tests. » » Sign up for the ButtonShy playtester network to get early peeks at Anthelion and many other upcoming ButtonShy games! Triangle games community featured in Indy Week! Sayaka Matsuoka from Indy Week did a special article on the tabletop game community in the Triangle area. She interviewed local game designers, store owners, and players! Check it out! 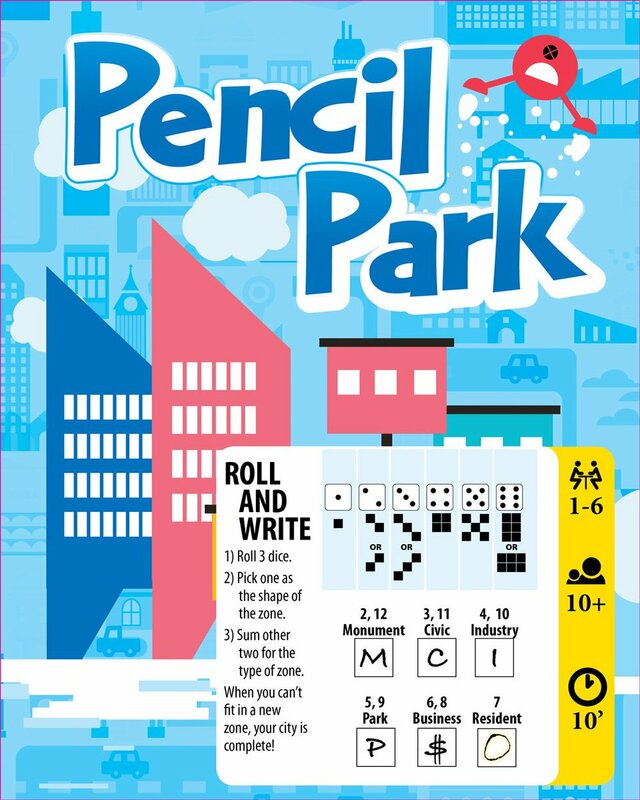 In my last post, I announced Pencil Park, a co-designed game with Adam McIver. For now the plan is to get a DriveThruCards edition out on the market while the timing is hot for a roll-and-write game. The tricky aspect was the "pencil" part of things. All of my tests had been with sleeved home-printed cards and dry-erase markers. In the off chance DriveThruCards' boxes couldn't fit sleeved cards, I had to test whether the bare stock itself could handle repeated dry-erase marking. Here are my test results! SCIENCE!! In all of these tests, I used relatively fresh Expo brand dry-erase markers and Premium stock DriveThruCards. Obviously I don't live in a lab, so I couldn't control other environmental factors like humidity and temperature, but I hope these results hold true for most home use. Naturally, I tweeted the results as they arrived. The first test I set out several cards covered in dry-erase Black ink. After the allotted about of time, I wiped away as much ink as I could with a dry paper towel. The results were very good for my purposes. After a typical game length, there would be minimal staining on the card. Even after 24 hours, the haze was pretty tolerable. I'm not sure how well it would hold up over repeated use, but for occasional use I think it's pretty good! Nat Levan was curious about how the different colors of ink might fare after a 24 hour period, so I set out all the colors I had available. Again, I wiped away as much ink as I could with a dry paper towel. The results were still pretty tolerable, but as he had expected some colors seemed to stain more than others depending on the light. Blue and Red seemed most hazy after the testing period. After those last two tests, I had a hypothesis. I wondered if it would do even better if it had an ink layer printed on it already to fill in all the pores of the paper. Photo 1 shows four different colors of Expo dry-erase markers on the printed cards after 24 hours of drying. Photo 2 shows two different methods of erasure after the drying period was complete. (2a) The lower half of each sample shows how much I was able to remove with aggressive scrubbing with a dry paper towel. That stuff is really well caked on. I thought this hypothesis was a bust, but I remembered someone on my timeline mentioned a trick for removing stubborn dry-erase stains. Just write over the stain again with a marker and erase both at once. (2b) The upper half of each sample shows how that worked out. Much better than a paper towel alone, but still more significant staining than on the less-printed cards. Photo 3 shows a close-up of the red sample results from Experiment 2 and the red sample results from this experiment. Even after using the marker trick, the surface from Experiment 2 was easier to erase and had less staining. Conclusion: That hypothesis is busted. I suspect that the unprinted surface of the stock is less absorbent at room temperature. The ink layer on top of the paper is somehow more porous, therefore takes the dry-erase ink more readily. So, if I'm to use cards as dry-erase components, I must keep the writing surface as blank as possible. About a week before UnPub 2017, I posted a weird little idea for a roll-and-write game. I didn't realize how much of a hit it would be until a few days later when I saw dozens of people playing it on home-printed or hand-drawn cards. It's been a fast development process since then, but where did it start? Someone on my twitter feed once described a game mechanism where the arrangement of pips on a dice face could literally be translated to a range of movement on a grid or an arrangement of tiles on a table space. If you're that person, please @ me so I can give you proper credit. Clearly that idea stuck with me for a while, eventually becoming the seed of Pencil Park. I've always liked drafting mechanisms that make what you don't choose as meaningful as what you do. In Seasons, the die result that no one chooses determines the pace of the game. In Small World, Belle of the Ball, and Century: Spice Road, the cards you don't draft get more valuable over time. I wanted to play around with something like the Can't Stop mechanism by Sid Sackson, where you choose two dice from a pool, but adding the more modern twist of making the remaining dice matter. So that was the beginning: You roll three dice. Choose two and add them together. That number corresponds to a type of symbol you will write on a piece of paper. The remaining die tells you how many of that symbol you will write. Furthermore, that die also tells you the arrangement that set of symbols must be drawn in. On a standard six-sided die, that meant a "4" would be a 2x2 grid of symbols. A "5" would be an "X" shape of two intersecting diagonal lines. Assuming the space available to draw these symbols is limited, I thought it would make for an interesting Tetris-style analog game where you have a bit more control over the pieces that may come. I made a set of nine city cards with grids of white squares and four empty inaccessible squares along with a first draft of six different types of "zones" that could be drawn. That was where Pencil Park began. Over the week leading up to UnPub 2017, I had a lot of people tweeting their home-made final boards to me to check their scoring. This was a clear indication to me that I had stumbled on something special, which was great news. the bad news, I didn't realize how much homework I had given myself during an already busy week! Clearly the next step would be simplifying the scoring system and clarifying its presentation so I wouldn't need to answer FAQs so frequently. That's where Adam McIver came in! Out of all the people who had been interested in Pencil Park, Adam was by far the most enthusiastic and willing to test weird new ideas. We chatted in-person during UnPub about some new ideas for new components and how the game might exist as a DriveThruCards product or a more traditional retail product. I've rarely had the chance to collaborate with someone who also shared the same history of graphic design and game design. It's been great! He figured out the math so that we would have a more balanced set of seven zones. We added two great new modes of play for more competitive strategic players. Adam made a set of Power Cards activated by a fourth die that gets chosen by the "Mayor" of the round. It's a really cool mechanic! 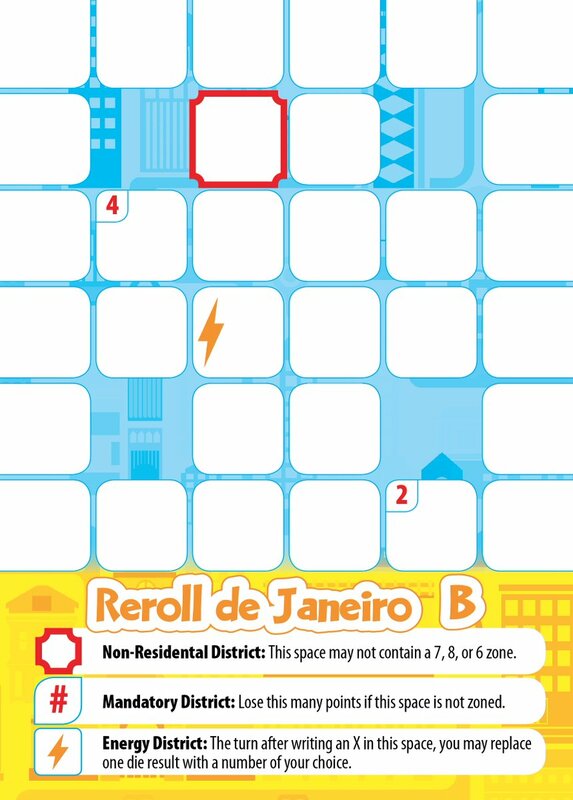 Now I'm preparing for the local UnPub Mini event at Atomic Empire on April 29 where I will debut a new draft of Pencil Park and test out all three modes of play: Block Party, City Council, and Town Rivals. Once I've had a chance to evaluate the playtest results and make the necessary tweaks, we might put up a new print-and-play draft for public review. Can't promise anything just yet, but at the very least you'll hear more about Pencil Park! Howdy all! Long time no see. It's been a wildly busy couple of months since last year, most of which culminates in this new game from Action Phase Games and Indie Boards and Cards. 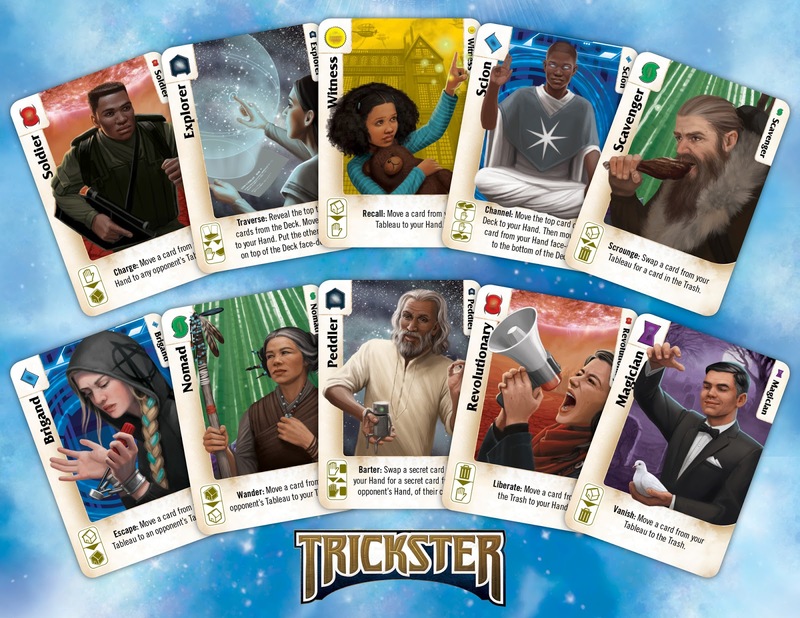 Trickster: Champions of Time is a big polished update of my old game series Trickster which long-time followers might remember from a few years ago. The art is all new, the base game contains more hero cards, and the expansions planned introduce even more. I handled art direction and Beth Sobel did the illustrations. I'm happy to have a diverse and inclusive cast of characters from across time and space so skillfully depicted in the game. Check out the video above and help spread the word. Thank you! Thanks for being patient with my slow posting schedule the past few weeks. I'd been preparing non-stop for BGGcon this year (and then catching up on all the other freelance work that backed up before then). I wanted to come to this con more prepared with prototypes that might be a better fit for the current market. Seemed to work out! It was certainly my most hectic and busy con in many years. Seemed like I was always bustling from one impromptu meeting to another the whole time. I arrived with about 7 prototypes and they're all now in someone else's hands. That's no guarantee of publishing, but at least it's a nice start! Always a good sign of a healthy business trip. The rest of my time was spent trying out fun new games and some old favorites with new friends. Check out the video above for a highlight reel of some of the games that hit the table. Belle of the Ball Second Edition Coming in December! Hey all! Quick update from Greater Than Games regarding Belle of the Ball Second Edition. It's being printed right now! Barring any unforeseen shipping problems, copies of Belle of the Ball Second Edition should be available on the Greater Than Games web store and on Miniature Market in early December. They'll be rolling into stores shortly thereafter. Cutting it a bit close, but GTG is 90% sure we'll make it! 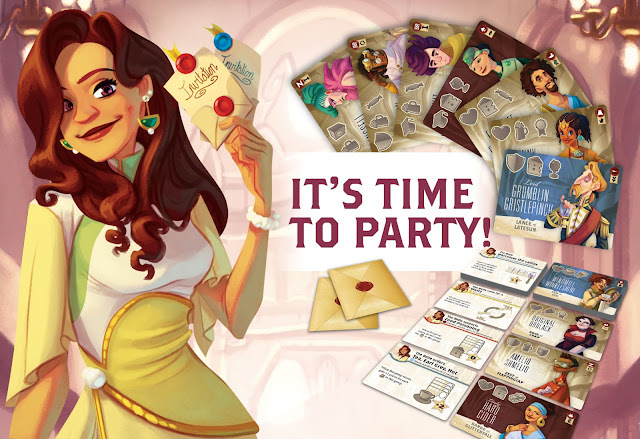 If you're a store owner and want to get Belle back on your shelves ASAP, contact paul@greaterthangames.com for info. If you own the first edition, here's a quick overview of some changes to the rules and a few bits of card text. New Tuck Boxes from DriveThruCards! 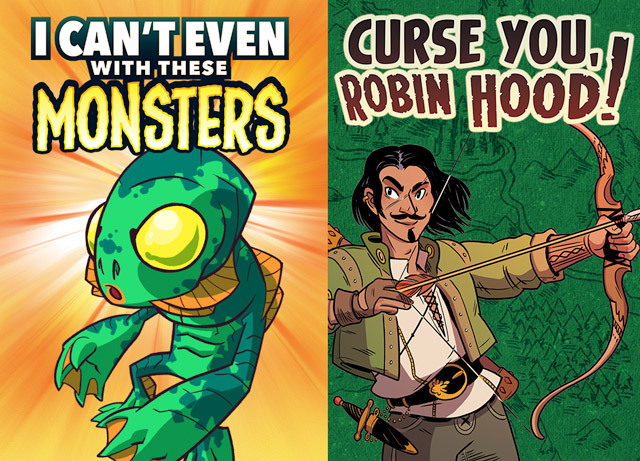 Tuckboxes are now live for I Can't Even With These Monsters and Curse You, Robin Hood! When you're in the checkout page, just select the third option for the item. It's entirely optional as always, but they look great. Here's a quick tour of their features! First off, the print quality is great as always. The print is smooth, the colors are vibrant, and the consistency is top notch. When you take a closer look, you'll notice this seam along the edges of one of the panels. This is because these boxes use no glue in their construction. They're entirely secured with folds and flaps. This has the additional benefit of making the box very rigid and sturdy. 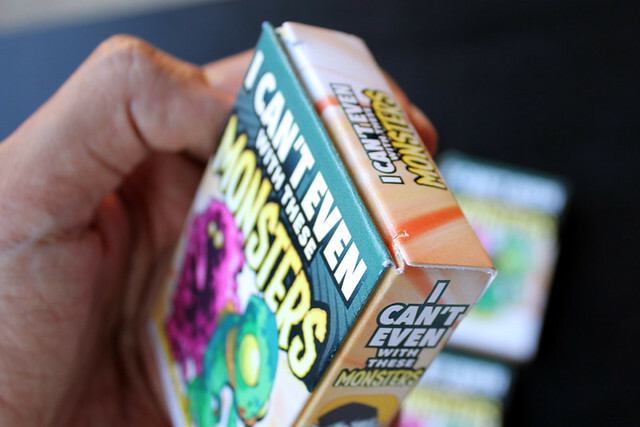 When you open the box, you'll see the deck of cards you ordered without the usual order # card or cellophane band that comes with no-box or plastic box decks. The rear hinge of the top lid needs a crease here to open properly, which is why I designed the back of my box to be on this panel. I set up the info bar to be just above that crease so it looks more intentional. I also made sure not to put any important text along this crease. Here's a close-up of the inside of the box, showing one other benefit of this construction. 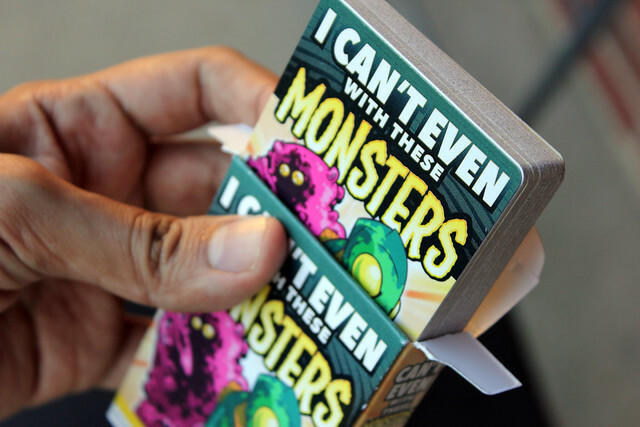 Unlike typical tuckboxes, there's no bottom flap sticking up, pushing against the cards. 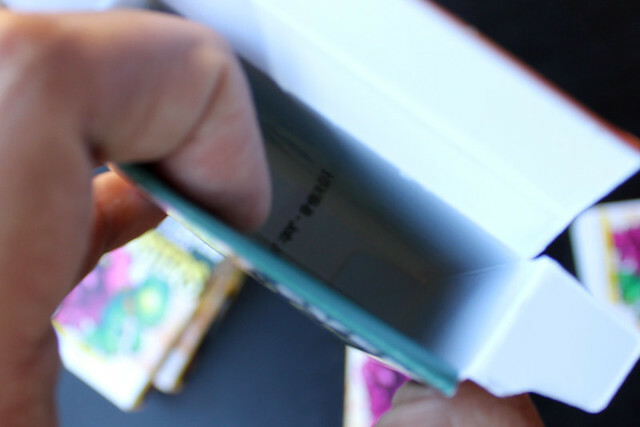 It makes returning the cards to the box an easy breeze. 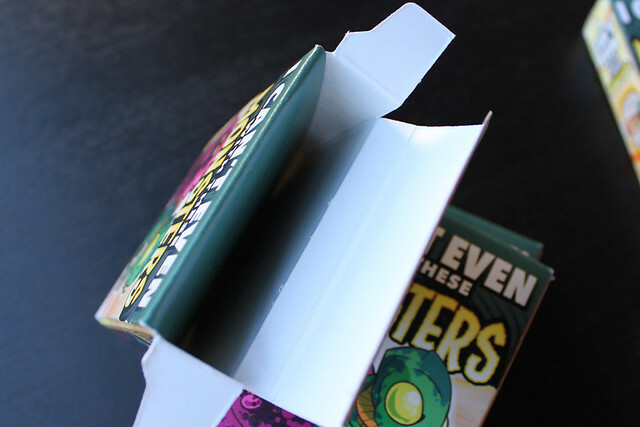 This big interior flap is the key to the whole box's construction. That flap sticking into the side a bit creates a gentle pressure against the deck keeping it nice and snug. And that's a quick overview of the new tuck boxes! I hope you dig them! Two New Card Games on Sale! Hello, all! These are the first two card games I'm self-publishing in over a year and I'm mighty proud of them. Curse You, Robin Hood! is a rowdy pub-style card game where you're merchants in Sherwood Forest trying to get as rich as possible. The only problem is that if you're the richest in a particular type of good, Robin Hood will steal it all from you. Different legendary characters will also join your game, introducing the basics of bluffing and negotiation to new players without getting in the way of gameplay. I really love the art by Molly Ostertag. » Buy it here: Curse You, Robin Hood! 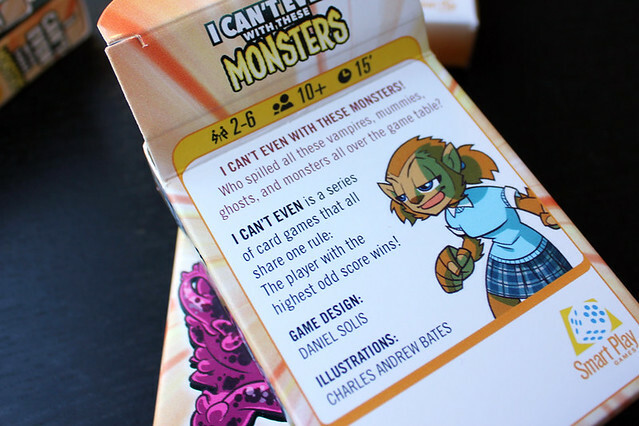 I Can't Even With These Monsters is the first game in the I Can't Even series. In these games, there's one major rule: Only the highest odd-numbered score will win the game. Even if four players have 22, 20, 18, and 3 points respectively, the player with 3 points will win. 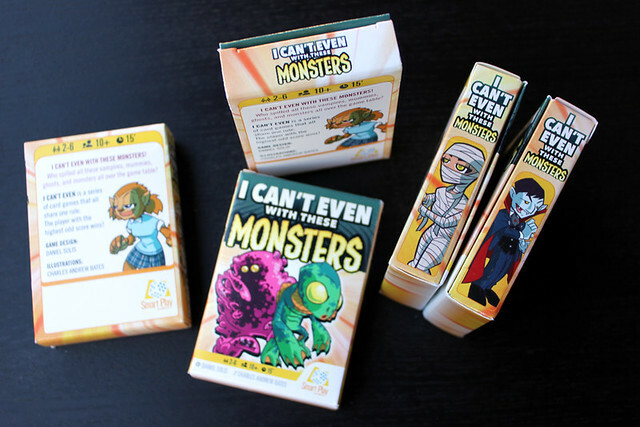 This edition introduces the basic concepts with seven fun monsters illustrated by Charles Andrew Bates. Howdy folks! I just got back from SPX 2016, the convention focused on independent and small press comics creators. Back in 2014 I briefly mentioned SPX as a great source for artistic talent. Last year I described the parallels between the indie comics and the tabletop game design communities. This year I'm just exhausted, so here's a link to the pinterest board of artists I met at the hall. 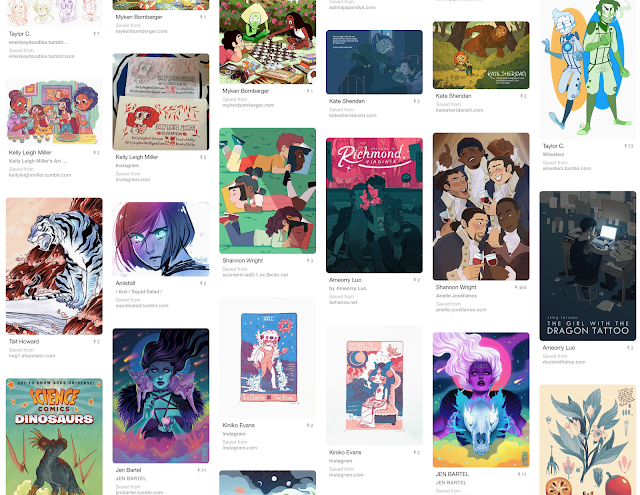 Most of these artists said they were available for freelance assignments, so if you're a publisher or art director looking for new talent, check them out! Fri: Toured the comics vault at Library of Congress. Saw a lovely Harrison Cady piece. Talked sci-fi movies with new friends. Then hauled boxes around the hall for set up. Sat: Line mgmt duty. Met The Adventure Zine artists. Saw the Ignatz Awards. Danced at (and evacuated from) the SPX prom. Sun: Mostly special duty. Saw @careydraws on Magical Girls panel! Then teardown, lifting, hauling. Alas, too tired to play Magic. Happy tho! Mon: Silver Diner breakfast with smart folks talking about creative life and work. And now I must sleep a week.